10 Buick Street high-rise apartments overlooking the Charles River. To help reduce expenses related to attending Neutrino 2014, we offer a low-cost housing option in the Boston University Student Village. Conference registrants may request housing in the Student Village in lieu of making hotel reservation. The Student Village housing is comprised of suites of four rooms with private bedrooms and two shared bathrooms, a kitchen and a common area. The suites are in a high-rise apartment building at 10 Buick Street with commanding views of the Charles River and Boston. Guests are supplied with bed and bath linens upon arrival. While daily maid service is not provided, guests can get fresh linens from the Front Desk. 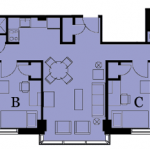 Please refer to the floor plan below for a typical suite at 10 Buick Street. The 10 Buick Street residence has several common areas including a rooftop lounge, several small meeting rooms on the lower level, and a market located on the ground floor. Laundry facilities and vending machines are available in the building. Located adjacent to 10 Buick Street is Boston University’s Fitness and Recreation Center. This 270,000 square foot facility features cardiovascular and weight equipment, two pools, a 35-foot high climbing wall, indoor elevated jogging track, seven multi-sport gyms, and courts for racquetball and squash. Memberships are available to conference guests for $12 per day or $30 for the week. The Student Village is located a short walk from the conference venue. The Events & Conferences Front Desk Staff is available to assist guests with checking in to the residence on their designated arrival date beginning at 3:00pm. Guests must check out prior to 11:00am on their designated departure date. The Front Desk Staff is also available on a daily basis to assist guests with both campus and general information. 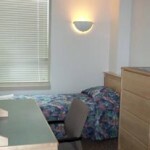 The cost for Student Village housing is $70 per night. Guests will be assigned to single gender suites unless otherwise specified. The reservation process will allow groups of guests to request sharing a suite. There is also an option to buy out a bedroom, should two or three guests wish to share a suite with no extra suite mates. Floor plan for a four-bedroom two-bath suite at 10 Buick St. Bedroom in a 10 Buick St suite. 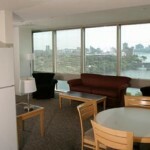 Lobby at 10 Buick St.
– All rooms within the suite are single occupancy with a twin-sized bed. – All reservations and payments must be made ahead of time as our venue cannot accept payments at check-in. – The primary reservation (not including accompanying persons) must be for a scientist registered for and attending the Conference. – Accompanying persons: If you plan to bring an accompanying person, please be sure to book multiple rooms. You may do so by choosing additional rooms with the “Total Number of Rooms” dropdown. We ask that you please include the following in the “Special Requests” textbox: “ACCOMPANYING PERSON: FIRST NAME LAST NAME.” If you choose this option, your request will be guaranteed. – Requesting to share suite: Requests to share a suite with specific individuals can be made utilizing the “Special Requests” textbox. Please be sure to include the individuals’ name and email address so that we may appropriately match your request. Such requests cannot be guaranteed, but we will make every attempt to honor your requests as space allows. Requests will not be honored for any individual who has not registered for the conference. – Buying out additional rooms: Registrants are able to ‘buy out’ additional beds or an entire suite. We ask that you please update the “Total Number of Rooms” dropdown to indicate how many rooms you would like to purchase. We ask that you please include the following in the “Special Requests” textbox: “BUYOUT: NO ADDITIONAL GUESTS.” If you choose this option, your request will be guaranteed. – Please note that gender information is only used to assign individuals without any special requests to same-gender housing. 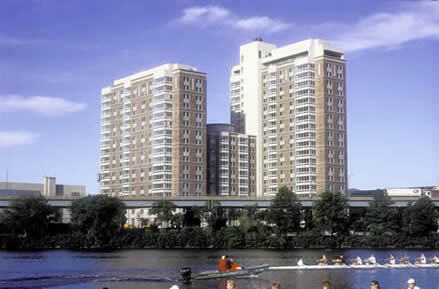 Application for housing in the Boston University Student Village for Neutrino 2014 is now closed. If you would like to request housing, please contact us by email at registration@neutrino2014.bu.edu. Future housing reservations will be made based on availability.